Snowden and the American flag: His first big PR blunder? 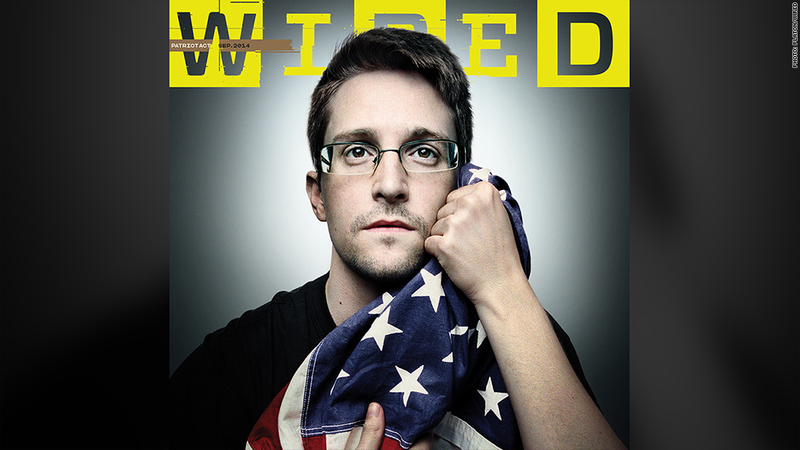 When I saw Wired magazine's cover photo of Edward Snowden clutching an American flag, my first thought was in the form of a question: has Snowden just made his first big PR blunder? My instinct was to say yes. From the moment in June 2013 that he was identified as the source for news stories about NSA mass surveillance programs, Snowden and his advisers have nearly always said the right things at the right times. He has cogently explained why he leaked NSA documents and effectively pushed back when American officials have attacked him as a "traitor." He has tried to make the debate about the government's behavior, not his own. Watch the Pentagon Papers whistleblower speak out on Snowden. Which is why the cover photo puzzled me. Wired published the cover on Wednesday along with an excellent profile by James Bamford. It shows Snowden covered by the red, white and blue flag, holding it in both of his hands, as if protecting it from the government. The cover is provocative and beautiful -- and yet there's something unsettling about it. The shot was taken by a famous photographer, Platon Antoniou, whose iconic portraits of world leaders and celebrities have made the cover of Time more than 20 times. "You're here to make history," Platon -- he goes by just his first name -- told Snowden before the photo shoot began in Moscow on June 13. Indeed, Snowden had not sat for a formal portrait session since his flight from the United States. The resulting photos are remarkable -- Snowden staring deep into the camera, glasses slightly crooked on his face; Snowden resting on what looks to be a hotel bed; Snowden facing away from the camera wearing a dark T-shirt with the word "SECURITY" emblazoned on it. But it's the flag-draped Snowden that stands out. It's clear why Wired picked it. What's unclear is why Snowden put himself in a position for it to be picked. Scott Dadich, the editor in chief of Wired, wrote in an editor's note that Platon brought a number of props with him to the photo shoot, including "American flag patches" and a big flag that was "actually the same flag brandished by Pamela Anderson in Platon's iconic 1998 George magazine cover." When Snowden picked up the big flag at one point during the shoot, "Platon asked him what he'd do with it in a picture," Dadich wrote, and Snowden then "held the flag in his hands and delicately unfolded it." "You could see the gears turning as he weighed his year in exile against the love of country that motivated him in the first place," Dadich continued. "He said he was nervous that posing with the flag might anger people but that it meant a lot to him. He said that he loved his country. He cradled the flag and held it close to his heart. Nobody said a word, and the hairs on the back of my neck stood up." Platon started taking a series of photos, and Dadich apparently knew right away that he had his cover. Related: Cybersecurity - how safe are you? According to Bamford's profile, Snowden is concerned about "what he calls NSA fatigue -- the public becoming numb to disclosures of mass surveillance, just as it becomes inured to news of battle deaths during a war." "I don't want the stage," he told Bamford. "I'm terrified of giving these talking heads some distraction, some excuse to jeopardize, smear, and delegitimize a very important movement." According to Dadich, he expressed that same concern when he picked up the flag. Maybe he was right to worry, and wrong to literally wrap himself in the flag. The resulting image almost seems intended to offend. I believe Snowden is a patriot. But the magazine cover is not going to persuade his doubters of that.